In response to the overwhelming demand from Hindi speakers, both within India and abroad, Isha Foundation has launched an exclusive Hindi magazine – Isha Lahar (Isha Wave). This 68-page, monthly magazine in colour, is an endeavour to reach out to all Hindi readers. 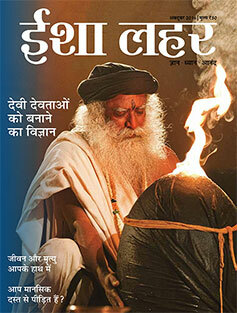 Isha Lahar is a monthly Hindi magazine for all those who are willing to live life to the fullest. It offers the extraordinary insights of Sadhguru – a modern mystic and yogi – on various dimensions of life. Sadhguru’s wisdom does not come from books or scriptures but from a profound inner experience, and is therefore of tremendous life-relevance. Each issue addresses significant topics, inviting the reader to perceive life as an endless possibility to be experienced. With its inspirational articles, Isha Lahar nurtures the innate yet often unconscious longing in every human being to seek the ultimate. It could be a vital tool to enhance one's intensity and growth. This magazine invites you all to explore the immensity and possibilities of a live Guru and his offerings to the world. Isha Lahar will soon be available in newspaper stands across major cities in India.